Peace tea instills the tranquility, patience and beauty of the earth. This rich, bittersweet blend grounds us in a flowing meadow of healing herbs. Traditionally the herbs in this blend have been used as sedative, anti-depressant, anti-tumor, nervine, as a sleeping aid, and for irritability and other ailments associated with nervous exhaustion. I don't really like the taste of this tea but I bought it for all the benefits of a relaxing tea before bed. I add a little honey and that helps. Very good ingredients in this tea though. I sleep unbelievably well when I drink this before bed. My new favourite! This herbs tea is very nice. Helps me relax and sleep better and it taste good. Perfect combination. 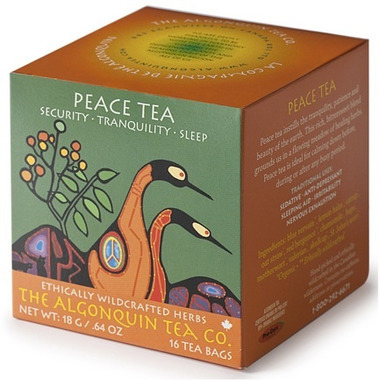 I suffer from chronic sleep issues and this tea has really helped me to relax and fall asleep more quickly. I've spent years taking Melatonin, drinking chamomile tea and other remedies to no effect. This tea is the first thing I've tried that has had a positive impact on my sleep. Wonderful soothing tea. Great to have before bed, relaxes me and makes me sleep through the night. Great flavor. Would highly recommend this tea especially for anyone that has difficulty sleeping. A beautiful tea. Very relaxing and delicious! Hard to keep it away from a very interested cat. Nice tea, but for my evening drink I prefer the taste of chamomile by itself. I suspect this might be the kind of thing that works if you believe it works, as with anything, herbal or medicinal. But since I believe it works, it works for me. With a teaspoon of honey I find the taste pleasant and as I said I do think it helps with a calm feeling before sleeping. Couple it with listening to Spiegel Im Spiegel by Arvo Part on youtube and you'll be well away with the fairies.